Did you know that you use about 65 gallons of hot water a day for laundry, shower and dishwashing duty? It’s no wonder that water heating is one of the biggest users of energy in the house. The question is, why would you heat more water than that if you’re not going to use it? That’s the logic behind a tankless propane water heater, which heats only the water you need, when you need it – bringing you an almost instantaneous and unlimited supply of hot water. Long, hot showers – You won’t run out of hot water after your kids get done with their showers, or waiting for the laundry to finish cycling. Better performance with lower bills – By operating only when hot water is needed, you’ll save energy and lower utility costs. Electronic ignitions also mean there is no standing pilot light constantly sapping energy. More value for your home – A properly installed, correctly sized tankless water heater will improve your Home Energy Rating System (HERS) and LEED scores, which adds value to your home if you choose to sell it. More space – Most of the wall-mounted tankless systems we install are about the size of a small suitcase – much smaller than a conventional water heater. The compact size allows for installation in crawl spaces, attics and other tight spaces – perfect for smaller homes. 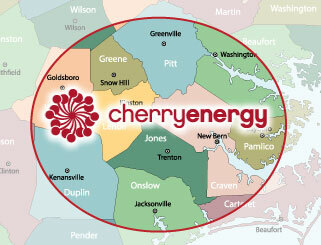 Make cold showers a thing of the past – contact Cherry Energy today to learn more about propane tankless water heaters for your home!